We often forget to consider the technological enviironment of our presentations. For example, if we deliver a presentation live and then put it on the Web for people to view later, will it make any sense without our spoken words? Probably not. Then you need to record your lecture and add it to the presentation, change the presentation to make the text more complete, or offer Notes pages that include your spoken words rather than the presentation file itself. 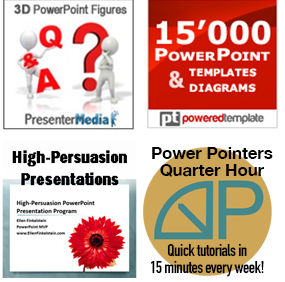 PowerPoint presentations are almost uniquely used as the medium for presenting during web conferences. At least, I’ve never seen any other method. How do you design a PowerPoint presentation for a web conference? Remember that people watch these seminars on laptops and the presentation area is only one portion of the total web conference application’s window. Therefore, be extra careful to use large fonts and charts. Keep a buffer of white space to separate the slide content from the surrounding panels (chat, attendees, other tools). Minimize animation — these often transmit poorly and some conferencing software doesn’t support animation at all. You need to work a little harder to connect with your audience, since they can’t see you. Add some informal chit chat, ask a question, and so on. Reduce the text and use graphics instead. People don’t want to read on the screen. Don’t try to cram in too much content; finish on time. If you run late, people will just leave their computer and go on to something else.